at the Stoney Woods Festival in Kiltyclogher. At the end of April 2017 the New Ballagh Centre was approached by Tyrone Productions with the idea of making a television series about the formation of an intergenerational choir. Leitrim was chosen as one of the most rural counties in Ireland to provide a contrast to the experiences of the urban choir in Dublin. The New Ballagh Centre in Rossinver was chosen due to its established and well trusted relationship with older people through the RISE Project. Following visits by David Brophy to local National Schools in Kiltyclogher and Rossinver, as well as to the Glens Centre in Manorhamilton, the first “taster” rehearsal was held at the New Ballagh Centre on 23rd of May. The first rehearsal attracted over 60 people and after that settled to 23 older people, aged between 63 and 91, and 18 children between 7 and 12. Rehearsals continued from then twice a week throughout the summer months at the New Ballagh Centre, led by Sligo based Choirmaster David Flynn. Shooting the video to 'Fix you'. 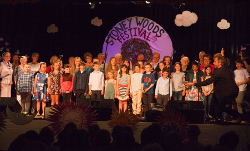 Only four weeks after the Leitrim Choir was formed they performed to an audience of several hundred people at the Stoneywoods Festival in Kiltyclogher on 30th June. A month later the Leitrim Choir met the Dublin Choir for the first time at the Ballroom of Romance in Glenfarne where they rehearsed and performed together for the first time, accompanied by the Leitrim Light Orchestra, which is made up of young people from 7 up to 17. 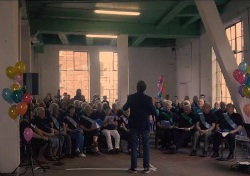 At the end of August the Leitrim Choir travelled to Dublin and met their Dublin counterparts again to record and film a music video together of the Coldplay song ‘Fix You’. 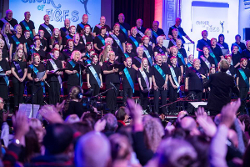 The final performance of the Choir of Ages took place during Positive Ageing Week on 28th September 2017 at the RDS in Dublin, accompanied by the Blow the Dust Orchestra, an orchestra comprised of older people. We can say we are very proud to have been part of this wonderful project and happy to have seen so many familiar faces from the locality attending and taking part in it. The choir was an absolute success and both, young and old, have utterly enjoyed working and singing together. Have a look for yourself on how well they came together as a choir.